The leaders of an organization are essential for translating strategy into action down through the organization. So the measure of leaders’ effectiveness can be seen in the behavior of their “followers,” in their ability to inspire, focus, and motivate direct reports and peers. Excellent leaders create momentum, commitment, initiative, and trust in others. More often than not though, organizations anoint managers and supervisors as leaders based on their job title or their technical expertise rather than their ability to align and motivate others. And you know a common outcome of this approach—leaders who resort to command-and-control or “nice” leaders who provide no clear direction or require any accountability. ADI’s first step in developing leaders is to assess their practices and impact on others. This helps leaders see that how others perceive them and their impact can be quite different from how they perceive themselves. 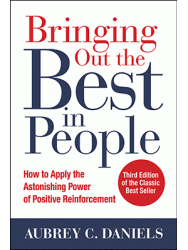 We provide objective and actionable feedback so that leaders can shape their own performance, establish themselves as reinforcers to others, and begin to have a more positive impact on others by first focusing on their own behavior. ADI also works with leaders to help them analyze performance problems and business issues from a behavioral perspective, so that their coaching of others and their decision making produces an outcome better aligned with their ultimate goals. ADI’s science-based approach to leadership will help your organization develop consistency in leadership excellence. You’ll have a reproducible management process for focusing your workforce on what matters most and for establishing positive accountability for making it happen. Your workforce will look to your leaders not because of their position, but because they have faith that your leaders can help them succeed.